Just recently Techwarelabs we were handed a new product from BEHRINGER to review called the PODCASTUDIO USB. This is a very interesting product for the internet generation. The PC users out there who are looking to put together their own little studio without much coin, read on as by the end of this review, you will probably be ordering one for yourself. The makings of a home studio setup have just been simplifed to your PC and this $99.99 PODCASTUDIO USB from BEHRINGER. Would you like to produce your own Pod cast sessions to be posted on the internet from a weekly sewing circle discussion to a DJ pod cast where your mixing up your own music to be heard later? 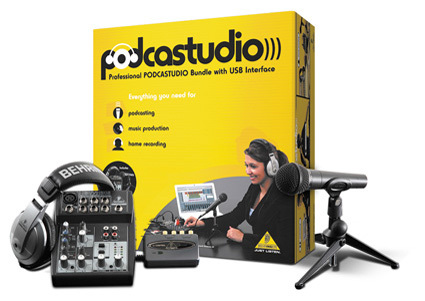 BEHRINGER has the PODCASTUDIO for a very reasonable price to get you started. *All trademarks (except BEHRINGER, the BEHRINGER logo, JUST LISTEN and PODCASTUDIO) mentioned belong to their respective owners and are not affiliated with BEHRINGER. Mac and Mac OS are trademarks of Apple Computer, Inc., registered in the U.S. and other countries. Windows is a registered trademark of Microsoft Corporation in the United States and other countries.